Yes, that is meatloaf in the picture above. 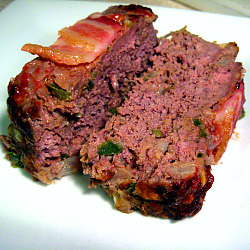 Random, I know, but would you believe that Gourmet has a plethora of meatloaf recipes? Shocking. So I bought ground beef at the store this week with intentions of making burgers topped with pimento cheese but we ended up going over to my in law’s on Monday to watch the NCAA Basketball Championship and had burgers there. That left me in a scramble to come up with a dinner using ground beef and the ingredients in my pantry. Enter meatloaf. My epicurious.com search of Gourmet’s ground beef recipes yielded a lot of meatball and meatloaf recipes. 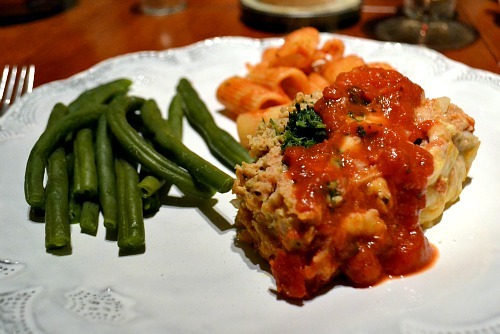 Since I’d already conquered meatballs for 68 Days of Gourmet, all signs pointed to meatloaf. Most meatloafs use a mixture of beef/pork/veal but I was able to find this recipe using only ground beef. 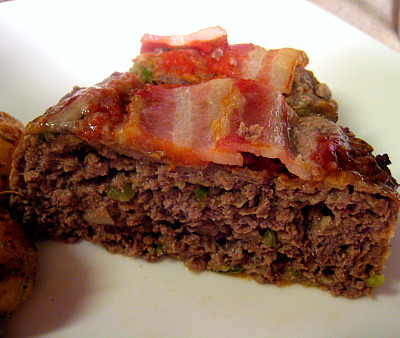 And while this meatloaf wasn’t really a stand out dinner it was extremely easy and economical and the bacon slices on the top definitely jazzed it up a bit. 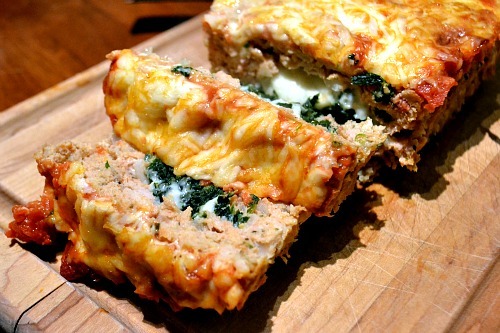 No more meatloaf talk. Yesterday I ran 3.5 miles with Sullie. Beautiful weather, miserable conditions. The pollen in Charlotte right now is out of control. I’m not exaggerating. Apparently it’s the worst pollen Charlotte has had since they started tracking it in the 90s. Everything is yellow. While I was running I could feel myself breathing in pollen. Not good. Of course I woke up coughing and sneezing this morning. No fun. But in other running news, I did register for the Marine Corps Marathon! So happy that tomorrow is Friday! Hope you’ve all had a great week! In a bowl whisk together the egg, onion, bell pepper, 2 tablespoons of ketchup, saltine crackers, Worcestershire sauce, salt and pepper to taste. Add the chuck and blend the mixture with your hands until it is just combined (do not overmix). Form the mixture into an 8- by 4-inch loaf in a shallow baking pan, spread the remaining tablespoon (or a little more) ketchup over it, and drape the bacon pieces across the loaf. Bake the meat loaf in the middle of the oven for 30 minutes, or until internal temperature reaches 155 degrees (mine took about 40 minutes).